The Regent Hotel is a bit down at heel but it served me well. My bag was packed and everything but my small torch (now found) was accounted for, including a first aid kit stuffed with ibuprofen to counter yet another root canal tooth problem. I wandered down to the ferry terminal and joined seven other Challengers for the short ride past sunbathing shags to Lismore. Lismore (meaning "great enclosure", or "garden") is an island of some 9.1 square miles less than an hour's ferry ride from Oban. It was once a major centre of Celtic Christianity, with a 6th-century monastery associated with Saint Moluag and later became the seat of the medieval Bishop of Argyll. There are numerous ruined structures including a broch and two 13th-century castles. During the 19th century various new industries were introduced, including lime quarrying. The population rose to 1,000 followed by a lengthy decline. Although resident numbers are now less than 200, there was a small increase from 2001 to 2011. About a third of the population were recorded as Gaelic speaking at the former date. The modern economy is largely based on farming, fishing and tourism and the largest settlement is Achnacroish, where we landed this morning.. Various shipwrecks have been recorded in the vicinity. Aaron and I found ourselves walking together along a good path, with Colin just behind us. Alan Hardy's group of five took the road route and missed the elaborate broch. This is Tirefour Castle, an Iron Age broch located 4 kilometres north of Achnacroish, situated on a rocky height on the east coast of the island. If we'd been more observant we may have been able to spot Ben Nevis to the north, and the Paps of Jura to the south, as well as the good view of Ben Cruachan that greeted us to the east. 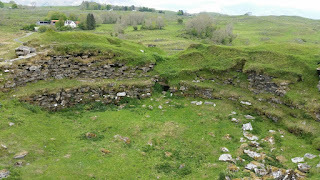 The broch was probably built in the late Iron Age. It was inhabited during the Roman era as shown by the discovery of an enamel brooch in the foundation layer. The broch was inhabited until the Middle Ages. Among the finds in it were a decorative pin from the 8th century and a Norse pin and rivets, dating from the 11th or 12th century. Located near the broch are the remains of a rectangular building in the Norse style. The Castle has an almost circular floor plan. We noted a narrow passageway in the walls around the outer circumference of the building, blocked off to avoid sheep getting in. A couple of Geordies were camped nearby in a fine spot. Wiki has lots more on the broch. Aaron and I had a 45 minute wait for the 12.15 ferry to Appin. Others had less of a wait, but everyone was assembled in plenty of time for eleven passengers and a driver to cram themselves into a small boat for the ten minute ride back to the mainland. 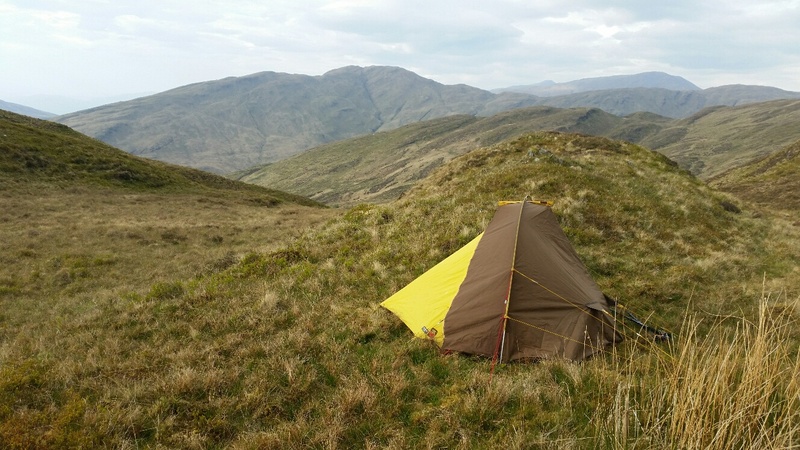 The Lismore adventure had proved an excellent way to start the Challenge with an easy stroll on a good path. 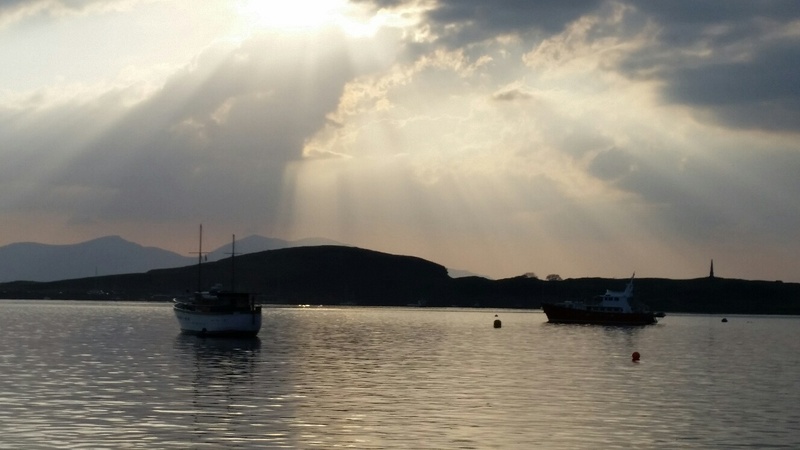 Appin may be a remote coastal district of the Scottish West Highlands, but it has its fair share of fish restaurants. We lunched at the one by the Appin ferry. I sat outside with a pint of best and enjoyed that together with a smoked salmon and cream cheese ciabatta that wasn't too soggified by the few drops of rain that preceded a slow change to the recent fine weather. The district formerly had a railway, but the Caledonian Railway company's branch line from Connel to Ballachulish was closed in 1966. It has recently been converted to a fine walking/cycling track that most of us used today. Appin is where the Appin Murder occurred on 14 May 1752, resulting in what is often held to be a notorious miscarriage of justice. It occurred in the tumultuous aftermath of the Jacobite Rising of 1745. The murder inspired events in Robert Louis Stevenson's novel Kidnapped. On 14 May 1752, Colin Roy Campbell of Glenure, 44, the government-appointed Factor to the forfeited estates of the Stewart Clan in North Argyll, Scotland, was shot in the back by a marksman in the wood of Lettermore near Ballachulish. The search for the killer targeted the local Clan, the Jacobite Stewarts of Appin, who had recently suffered evictions on Campbell's orders. The chief suspect, Allan Stewart, having fled, James Stewart, one of the last leaders of Stewarts, was arrested for the crime and tried for the murder. Although it was clear at the trial that James was not directly involved in the assassination, he was found guilty "in airts and pairts" (as an accessory; an aider and abetter) by a jury consisting of people from the locality where the crime occurred. Accordingly, James Stewart was hanged on 8 November 1752 on a specially commissioned gibbet above the narrows at Ballachulish, now near the south entrance to the Ballachulish Bridge. He died protesting his innocence and recited the 35th Psalm before mounting the scaffold. To this day in the Highlands, it remains known as "The Psalm of James of the Glens." Airds Hill is a low, densely-forested summit rising to the east of the popular village of Port Appin. It's a Marilyn. So it's there to be climbed, but only a very small minority of Challengers, namely Colin Crawford, recognise this fact. I was therefore somewhat astonished when Aaron said it was on his route as well as mine. It's 181 metres high. Sometimes the small hills are the most demanding. We dumped our bags near the bottom and started up a forestry track, leaving it where requested due to forestry operations. There followed a kilometre of bog, thick forest and the debris of fallen and felled forty year old trees. Halts were needed to remove twigs from down our sweaty necks. The summit was a high point in a thick forest. No views at all. 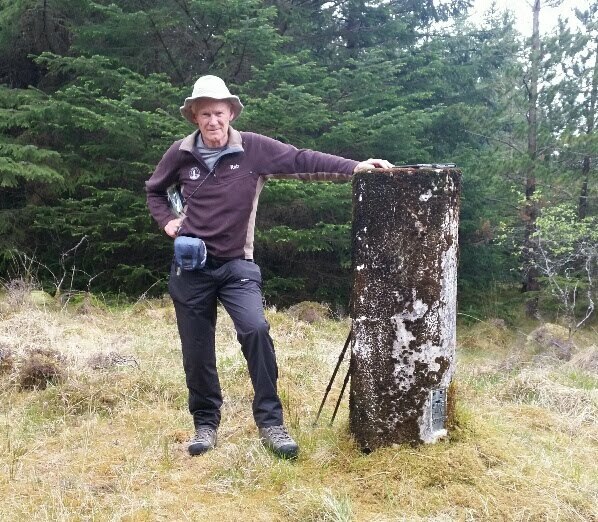 A few hundred metres away an old trig point struggled to be seen through its mossy camouflage. An equally obscure and tedious descent brought us back to the road, and the end of my ten mile saunter with Aaron. Since then I've seen one person, a farmer. It was good to have company for the start of what I anticipate will be a fairly solitary crossing. My route continued as planned. The old railway line to Inver folly was lined with plantains and bluebells. Then a track led me slowly, very slowly, to a stream from which I'd decided to collect water for the night. There was just a dribble of good water at NM 971 458. Even slower, I then toiled up to point 430, passing hairy caterpillars and a lizard, as well as the familiar blue flowers of milkwort. Lousewort and tormentil were also in evidence, and I was surprised to see so many bluebells on the open hillside. By the time I reached a camping spot at exactly the place I'd suggested on my route plan, the only sounds were of my first cuckoo of the year, chattering grouse, and barking red deer. It's a good spot, but perfectly calm, so a little midgy. I'm tired, but not very hungry after the large lunch. Today's pictures are of the broch, the trig point on Airds Hill, and my campsite. Up at 6 o'clock; walk to Navigation Road - 7.04 > Northern Rail to Manchester Piccadilly > Trans Pennine to Preston > Virgin Pendolino to Glasgow Central > walk to Glasgow Queen Street for lunch > Scotrail to Oban - arriving 15.28. (Cost £29). Barbara Sanders was the first Challenger I encountered - on Preston Station. There were more on the train to Glasgow, but I spent a pleasant journey with a chap called Stuart, visiting Glasgow for a short business meeting. Q: "Why not have a video conference?" A: "I want to see the whites of their eyes..."
Lots of Challengers, as always, on the Mallaig/Oban train that splits at Crianlarich, and 'meet and greet' was provided at Oban by Mick and Gayle. After dropping off my bag at the Regent Hotel I wandered past black guillemots flirting on the seafront to Mick and Gayle's new campervan, Bertie. Graham B and I enjoyed afternoon tea and cake and a conducted tour of the impressive Hymer vehicle. Then it was back to base before a visit by the four of us to an excellent fish and chip shop with indoor dining. A visit to the ferry terminal then set me up for tomorrow. 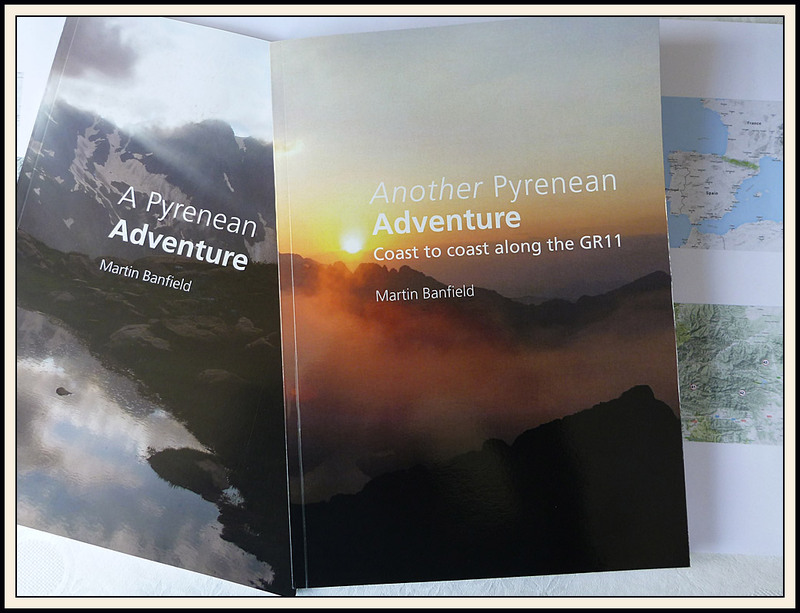 I'm inserting a bit of Wiki information about some of the places I pass through on this, my eleventh TGO Challenge. 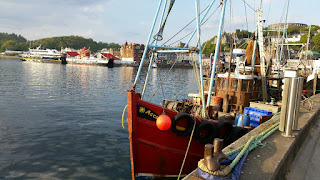 Feel free to ignore them, but I'll start with a bit about Oban. Oban (meaning The Little Bay) is the largest town between Helensburgh and Fort William. During the tourist season, the town can play host to up to 25,000 people. To the north, is the long low island of Lismore, and the mountains of Morvern and Ardgour. 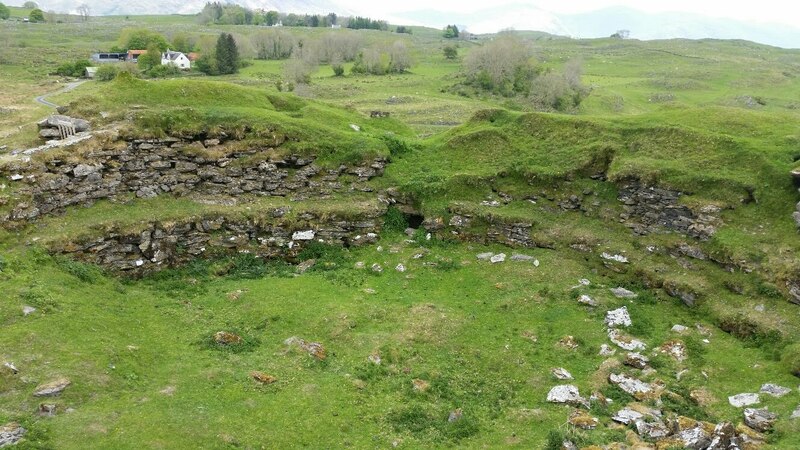 The site where Oban now stands has been used by humans since at least mesolithic times, as evidenced by archaeological remains of cave dwellers found in the town. Just outside the town stands Dunollie Castle, on a site that overlooks the main entrance to the bay and has been fortified since the Bronze age. Prior to the 19th century, the town itself supported very few households, sustaining only minor fishing, trading, shipbuilding and quarrying industries, and a few hardy tourists. 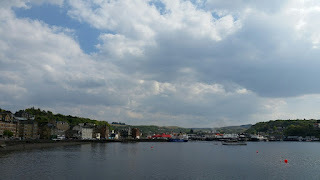 The modern town of Oban grew up around the distillery, which was founded there in 1794. The town was raised to a burgh of barony in 1811 by royal charter. Sir Walter Scott visited the area in 1814, the year in which he published his poem The Lord of the Isles. Interest in the poem brought many new visitors to the town. The arrival of the railways in the 1880s brought further prosperity, revitalising local industry and giving new energy to tourism. Shortly thereafter, McCaig's Tower, a folly and prominent local landmark, was constructed, as was the ill-fated Oban Hydro. During World War II, Oban was used by Merchant and Royal Navy ships and was an important base in the Battle of the Atlantic. The Royal Navy had a signal station near Ganavan, and an anti-submarine indicator loop station, which detected any surface or submarine vessels between Oban, Mull and Lismore. There was a controlled minefield in the Sound of Kerrera, which was operated from a building near the caravan site at Gallanach. There was also a Royal Air Force flying boat base at Ganavan and on Kerrera, and an airfield at North Connel built by the Royal Air Force. Since the 1950s, the principal industry has remained tourism, though the town is also an important ferry port, acting as the hub for ferries to many of the Hebrides. There was a fair amount of 'ferry activity' in evidence this afternoon. Today's pictures were all taken on Oban's seafront. Note McCaig's Tower. Tomorrow I head off to Oban to walk across Scotland for a couple of weeks. Details are here. Immediately I get back I’m taking part in the Great Manchester Run (or is that ‘Great Run Manchester?). It’s normally a 10 kilometre run, but this year they have added a half marathon event. Perhaps foolishly, I entered it some time ago and the arrival of a timing chip a few days ago suddenly reminded me of my foolhardiness. I know a lot of you sponsored me recently for my first marathon attempt (reported on here), but this is only my second half marathon (the first one was some years ago in Macclesfield) and it will be hard work with tired legs from carrying a 15 kilo rucksack for nearly 200 miles across the mountains of Scotland. So I’ve started another JustGiving page, here, if anyone would care to make a small donation. The Levana Partnership team will be really most appreciative. I know the money I raised by doing the Toulouse Marathon (£3150 including Gift Aid) enabled the charity to provide much needed support to a second township school in Cape Town. The page is here, should you wish to donate. The next posting should be from Oban after a long train ride…. Another Saturday, another parkrun, the fourth week in succession for me, though sadly we’ll only get three or four more such outings before October. Today’s run director was Alan, who decided to write down the names of people talking whilst he was trying to address the 350 or so runners – quite a task. Detention takes the form of being required to run an extra 2+ km lap. Today’s visitors (‘tourists’ in parkrun speak) were from as far away as Burnage and Australia. The conditions were fast. There were lots of PBs. Andy Wright should have come along instead of getting held up by the crowds at Stretford. 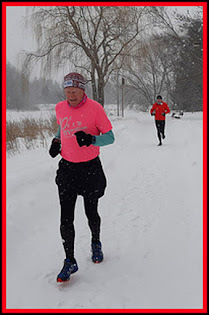 It’s a shame this is the last run for me for a while as regular turnouts bring increases in pace – this week enabling me to get the best time in my age category, thanks to overtaking Michael, who usually finishes well ahead of me, in a sprint to the line. Also sprinting to the line were the runners shown below, going so fast they were just a blur as they passed the lens of the camera. Well done everyone, especially the tail ‘runner’ volunteer, Martha, who had to accompany the backmarkers for well over an hour.